When people first came to Ireland around 10,000 years ago, almost certainly they were familiar with skin boat technology. There are images of coracles (or curachs as they have long been known in Ireland) on stone panels at Nineveh in Iraq from around 700 BC. Mediaeval Irish sources describe St Colmcille going into exile and St Brendan going on a fabulous sea voyage in similar hide-clad boats. When Michael O’Brien made coracles for salmon fishing on the River Boyne at Oldbridge, Co. Meath in 1928, he was therefore carrying on an immemorial tradition. Its basket-like wooden structure, tightly sealed in leather, harks all the way back to the island’s first inhabitants. The Boyne coracles were oval shaped, generally made from woven hazel rods and covered with locally tanned cow-hides; the size varied from six feet by four feet to six-and-a-half feet by four feet, so that the vessels could easily be covered using a single, large hide. Ireland had been, over the previous century, a place of traumatic upheaval: land wars, famine, mass emigration, the emergence of industrial Ulster, the shift from Irish to English as the vernacular language. Yet it also retained elements of an extraordinary continuity. The new Irish state tended to exaggerate that continuity, romanticising life in isolated communities, especially on the Aran and Blasket islands off the west coast, as the essential repository of authentic Irishness. The subtle and complex accounts of their own lives given by islanders like Peig Sayers and Tomás Ó Criomhthain were pasteurised into official texts for the state’s main cultural project: the revival of the Irish language as the national vernacular. Robert Flaherty’s 1934 film, Man of Aran, added a layer of timeless myth—not least to the curach itself, which featured centrally in its dramatic scenes of islanders battling against the sea. Much of the reality—especially poverty and emigration—was winnowed out of this ideal of a noble and ancient culture. (The ironies came home in 1953 when the Blaskets were evacuated and most of the islanders went to live in Springfield, Massachusetts.) The attempt to revive Irish as the everyday language—perhaps always doomed in a society where one in two people would emigrate—failed. Some official policies, such as censorious attempts to stamp out traditions of holding dances in houses and at crossroads, actually damaged the real folk culture. Yet there was something genuinely remarkable about the degree to which aspects of an older culture really did retain their vigour. The Irish language outlived predictions of death. Traditions of oral storytelling, exemplified by Sayers and recorded by the Irish Folklore Commission, persisted at least into the era of television. Irish music in its different forms, from dance tunes to slow airs to the distinctive, haunting tones of sean nós singing, continued to sound out—not just in Ireland but in Irish communities abroad. Ancient religious practices, centred on holy wells and holy mountains, carried on, albeit in Christianised forms. None of these forms was static—no living culture ever is. Each was open to periodic ‘revivals’which were in fact re-inventions. What mattered is that they survived even the potentially stultifying embrace of officialdom. They did so because people still had a use for them and could adapt them to their own times. 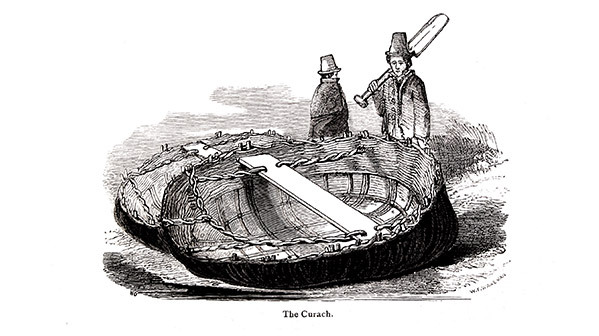 Curachs are still widely used in the west of Ireland, most of them now covered with fibreglass while retaining their traditional shape. Like so much of Irish culture, they are the same only different.